The first time I’d ever tried this salad was 1997 when we were opening a series of cafe`s at 3M in Minnesota. A visiting Chef/Manager from Chicago, Steve, was helping fill the mile long salad bar and this salad was showing off front and center. I’d never seen anything like it before! Like most Chefs, Steve was eager to tell us of the salad’s origin and it’s components – an Italian peasant’s way to use up day old bread. Peasant shmeasant – We say FULL – colorful, delightful & flavorful! Minnesota came and went right along with the salad. We eventually moved to Chicago and found a great local brew pub called “Mikes” with the best pub menu EVER! It had among other items – the BEST wings (several different kinds), awesome burgers served with tots, fresh salads in homemade cracker bowls even crab cakes came out of a shoe-box kitchen. It had the greatest neighborhood atmosphere and we partook of its delights frequently (we miss it dearly)! One night we met one of the owners – it was Steve! It had been five years since we’d seen him in MN and it took a little memory cajoling on all our parts but the Panzanella Salad brought it all back for us. 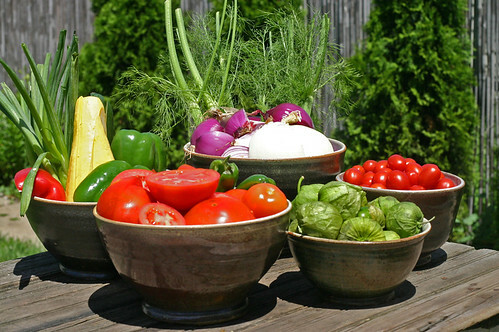 Veggies for Gazpacho and Panzanella! Anyway – back to making the salad. I grilled up a TON of veggies for this and the gazpacho. If you’ve seen my little coal grill you’d understand why it took me forever to grill all these veggies!! Now there is no need to grill the veggies for this salad – it tastes equally delicious without all the fuss. I just like the smoky flavor the wood coal imparts. This is one of my favorite salads. I love it when the dressing soaks into the crusty bread. 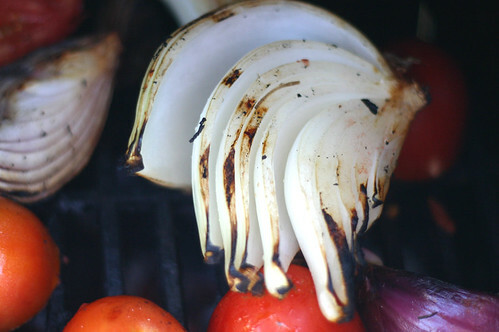 The char of the grill adds so much flavor. 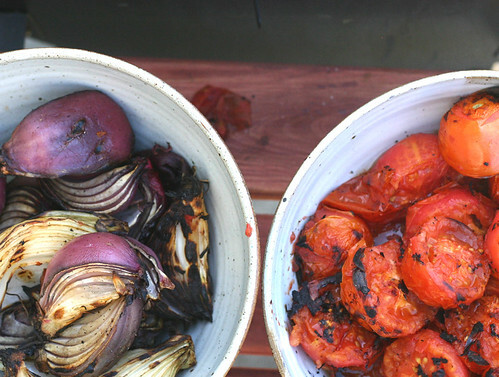 The perfect dishes for summer. I was just thinking about this salad when I saw your photo on tastepotting. 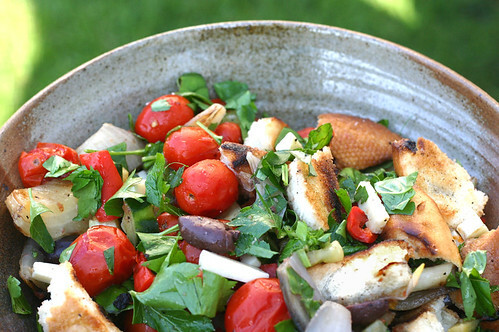 I love panzanella, and it’s a good thing, with all the bread I let get old around here! Thanks for this inspiring recipe – I want to try it soon! This is such a gorgeous salad. 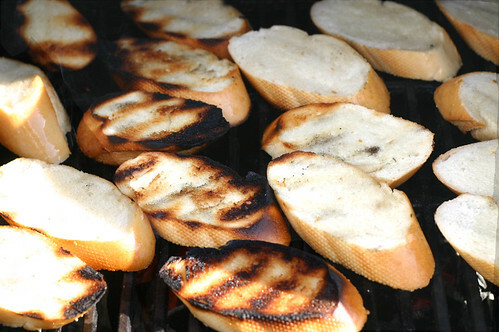 I grill vegetables almost daily so I will definitely try it with the bread and vinaigrette.